“The Essential Bruckner”, consisting of the three symphonies with the strongest connections to Wagner, is the first instalment in a project to record a complete cycle of Bruckner’s symphonies including “Die Nullte”. 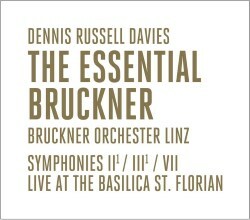 This undertaking might at first glance seem redundant, given that Dennis Russell Davies and the Bruckner Orchester Linz have already recorded a set for the Arte Nova label but the inspiration behind it was to recreate performances in the resonant acoustic of the St Florian basilica, with which Bruckner was so familiar. These are big, broad accounts by the state orchestra of Upper Austria, which is thoroughly habituated to playing this music; they sit squarely in the performing tradition promulgated by Celibidache and carried on by apparent disciples such as René Ballot. That very resonance, which endures some several seconds, governs Davies’ approach to the famous pauses and fermatas in Bruckner’s symphonies, not just in the so-called “Pausensinfonie” No. 2, but throughout all the three symphonies here. Davies’ conviction is that Bruckner’s pauses need time to register and produce their required effect in that cavernous acoustic. Not that the sound here is muddy or indistinct; the balance between groups of instruments is excellent and the very slightly “tubby” nature if the sound merely lends weight and impact to proceedings. Given that Davies has chosen to perform the original versions of these symphonies, the most obvious comparisons are with Ballot and various recordings by such as Herbert Blomstedt, Eliahu Inbal, Simone Young, Ivor Bolton and Gerd Schaller. The latter two both recorded the Second using Carragan’s 2005 edition of the 1872 score, Schaller in the same year as Davies and Bolton recently, in 2015. I would not say that there are enormous differences in approach or result amongst these conductors; all make the best case for the restoration of 250 bars and placing the Scherzo second. The bucolic, Alpine sections certainly blossom and bloom in this, the longest and most leisurely reading of the Second so far, but the steady, spacious pulse and the air around the sound also lend a kind of epic menace and demonic intensity to the Scherzo, aptly contrasted with the lilting waltz of the Trio. The Adagio is serene, rapt and exalted and the Finale creates a surprisingly fleet and propulsive impression, despite the evidence of raw timings. I understand some listeners’ preference for the streamlined versions of other symphonies, such as the Schalk editions, but Davies’ choice of the original version here is vindicated by the sustained beauty of the orchestral playing: the horn solo in the Adagio is sublime, the brass make a riotous impact in their climactic, triple forte interventions and the contributions of the oboe and flute in the first movement are especially tender The finale can become bombastic and even prolix with its potpourri of fragmented themes, but here it is simply thrilling. The Third is similarly grand and protracted. At 80 minutes’ duration, it is only slightly shorter than Ballot’s monumental account but those like me who enjoy classic recordings of the Schalk version by such as Knappertsbusch - albeit often in iffy mono sound – will enjoy the contrast between this and a recording almost half an hour shorter. There are many mightily impressive moments in Davies’ recording, especially the cumulative power of the final restatement of the insistent, falling minor octave main theme of the first movement. In the same vein, the march, punctuated by breathing pauses, which concludes the Adagio, is magnificently controlled. The three-quarter-time passages in the Scherzo are so deliberately paced that their martial quality is underplayed and is perhaps too relaxed, but Davies’ gradation of dynamics and subtlety of phrasing are masterly and there is a lovely lilt to the Trio. The finale builds inexorably to a wholly satisfying conclusion, even if the timpani are sometimes a bit lost in the tumult. The recording of the Seventh is the most recent and exhibits the same virtues as the previous two performances: a steady, patient pulse, a grand, majestic manner, fairly conventional timings, typical of those conductors who have adopted the more long-breathed approach to the execution of Bruckner’s symphonies, and euphonious playing, especially from the combination of horns, strings and trumpets at the peroration of the first movement. The Adagio makes its mark as the emotional heart of the work, the lower strings and Wagner tubas providing a deep, warm cushion of sound to sustain Bruckner’s threnody for the Master – and in a symphony where the use of percussion is sparing, the climactic appearance of the combined cymbal clash, triangle and timpani is highly effective. The Scherzo is massively insistent success – as it invariably is in the hands of a good orchestra and conductor. The Finale is emphatic, rising to a magnificent, triumphant conclusion. In terms of both artistic and technical execution, this initial collection represents as faithful a rendition of Bruckner’s sprit and intentions – insofar as they are clear from the scoring conundrums he bequeathed us – as the devoted Brucknerian could desire. I look forward to the accomplishment of this dedicated project. A peculiarity here is the designation of the performing edition of Symphony No. 7 as “1883”, which, unless another original, uncorrected manuscript turns up, cannot be the case; what Bruckner wrote in the 1883 autograph is full of additions in other hands and even pasted over with revisions made in 1885, most probably at Bruckner’s request, rendering a reliable reconstruction of the original impossible. Hence what we hear in this release must perforce be the 1885 version combined with aspects of the 1883 version as restored by Haas, including, of course, the cymbal clash. I acknowledge and refer here to www.bruckner.webs.com/versions.html, the compilation of Bruckner Symphony Versions compiled by David Griegel, and additionally sought clarification from the editor of the Bruckner Journal.